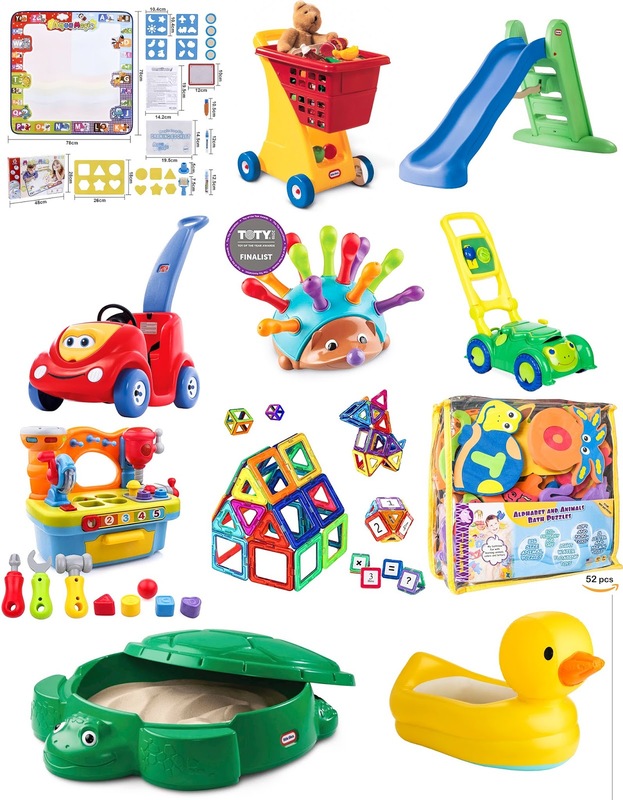 We are in full toddler mode now with Miles and I thought I would share some of his favorite toys and ones that we will continue to use as he gets older. Some are educational or help with motor skills and others are simply fun for him. 1. Aqua drawing mat - This is the most recent toy that I got him and it's a no-mess coloring mat! It comes with pens and brushes that you fill with water and then when they write on the mat, the color shows up underneath. 2. Shopping cart - This was one of the main toys that helped Miles learn to walk, and is still a toy he plays with daily. He loves to push it around the kitchen and family room, and will put things in and out of it all day long. I also bought him this box of fruits and vegetables to go with it, but he tends to play with those separately right now. I think over time he will find it fun if I set up a little store that he can "shop" at. 3. Slide - I pulled the wrong image for this slide as this is the one for older kids. However, I linked the correct slide that I just bought for Miles. It's much smaller and suitable for kids as young as 18 months. I think this slide will be a good way for him to be physical and exert some energy. 5. Hedgehog toy - I recently purchased this hedgehog for him after my girlfriend recommended it to me. It helps with fine motor skills and as he gets older will be great for teaching him sorting and colors. 6. Lawn mower - Ok to be honest, I wanted a toy that was simply an "outside" toy. We would bring things outside to play with and then I hated having them come back inside so I thought this lawn mower would solve that issue. And it did! He pushes it around, fills it up with sticks and mulch and then we can leave it in the garage. Yay! 7. Toy workbench - Miles loves to bang on things and make as much noise as possible. So I thought this workbench would be perfect. He loves putting the shapes in their respective holes and then opening the drawer to find them. It also makes a ton of different sounds which is fun for him (and super annoying for us LOL). 8. Magnetic tiles - When we recently visited a local children's museum, these were the only toys all the little boys wanted to play with. Miles enjoys picking them up and carrying them around, but he is a bit too young to build anything yet. However, I know these will be fun for him in the next few years. 9. Foam bath toys - I struggle to find things to keep Miles entertained in the bath because he is over it after a few days. #toddlers But I bought these foam toys because they will be great to use for the next few years. They are in the shapes of different animals and have letters cut out of the middle. I don't give him the small letters yet but he loves to put the animals up on the bath wall. I don't find that he wants to chew on them (though we never leave him unsupervised), but if your toddler likes to chew, this may not be a good toy yet. 10. Turtle sandbox - Stan bought this for Miles but it was winter and we couldn't put sand in it and use it outside. So I filled it with plastic balls to make it a mini ball pit and Miles is crazy for it! And if we have any other kids come over the house, they immediately go to it. I decided to get a sand table instead for him this summer so he could still make a mess in the sand but not be sitting in it. What are your child's favorite toys? Any good suggestions? Let me know!